In order to build a strong brand, you need to stay connected with people that you wouldn’t normally see on a daily basis. As you are building your brand, you want to think about how you want to be perceived by strangers. It is important to establish a good rapport. The secret is to build relationships by being authentic and contributing in the community. Facebook posts can reflect your views and life’s journey. There are many ways, but the best is by trial and error. When scrolling through the news feeds, certain posts can evoke different emotional reactions. How did you feel during the election? When everyone was emotionally charged for one reason or another, to me, those posts were really tough to read. I had to learn how to scroll by, and in some cases, I unfollowed or removed friends from my list. It was really hard to resist the urge to add my comments, and I had to keep reminding myself that this isn’t the effective way to do this. It is important to understand that Facebook shouldn’t be used just to sell stuff. You will quickly find that people will leave your group or unfriend you if all you do is share your latest promotion. Treat it like you would when you join a networking group or attend a social function. You don’t walk up to someone and ask them to buy from you right off the bat. You have to get to know them first. You need to build trust by engaging with them so they get to know you. Once you do, the business will flow naturally. I have so much to say and a great deal of expert knowledge on QuickBooks®. In order to build an image as an expert, I need to share my knowledge within my groups. I write blogs often and share them on Facebook. Whenever a client or partner asks an important question, I automatically think, “I need to write a blog about this.” This way, I can share it over and over to help many others when they run across the same issue. I recommend posting content once or twice a day. Make sure that the content relevant to the group you are sharing it to and be sure not to post the same information over and over. You want to keep your audience engaged and active in your groups. A few years ago, I found myself really busy and was feeling overwhelmed. The stress was wearing on me and I needed to do something about it. I started walking every day before work to start my day right. This helped me to get my mind right each morning and organize my thoughts before the day takes over. When I walked around our neighborhood, I saw things that reminded me of a big project I was working on. I was working to automate some of our everyday tasks to solve some major workflow issues. I knew it would take a team of experts to figure different aspects and solve this problem. 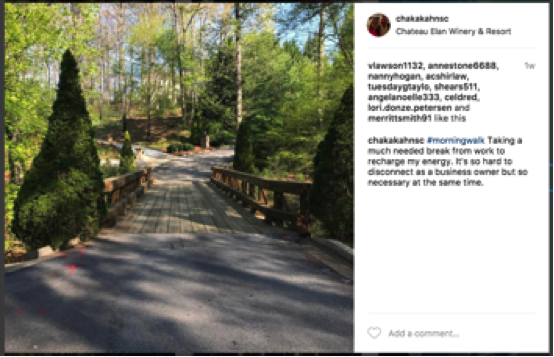 As I crossed a bridge, I would think, “Hmmm, bridging different people together to get the job done.” I would create a post and add my thoughts from my walk. I always use the hashtag #morningwalk. I post it on Instagram so that I can use the fancy photo filters, and then share it to Facebook and Twitter. I walked everyday for about a month and then stopped. Little did I know, my post was being followed. People were actually looking forward to my morning walk and I had no idea. Then, guess what happened? My friends reached out to me and let me know they missed my walk posts and were checking in to see if everything is okay with me. They told me my posts inspired them to start walking and enjoy their neighborhood. Some even reported that they lost weight! I couldn’t believe it … I had created a following. It was that moment that I realized my posts were making a difference and helping me build my brand! Think of this as throwing spaghetti on the wall to see what will “stick.” Keep an eye on which posts get the most attention and which ones get ignored. Everyone’s friend list and feed is different. There isn’t a set formula for what works. Try different groups and sharing new content. You want to make yourself stand out, and not just share information. Be active enough on Facebook to still balance your real life, while keeping in mind you are creating your brand. Editor’s Note: Check out part 2 of this two-part series on using Facebook groups to stay focused.